Powering the DF4, a single-cylinder 4-stroke OHV engine with a large displacement of 138cm3. Its excellent mid-range torque combined with light weight results in excellent acceleration. 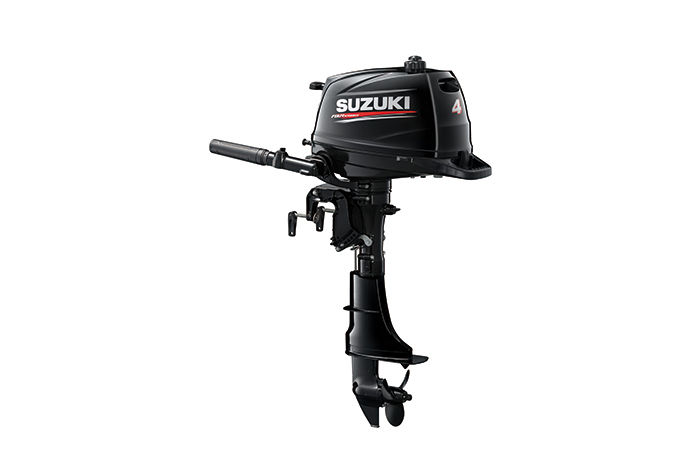 Carrying the outboard is made easier with the incorporation of a large, ring shaped carrying handle. Designed with smooth edges and lacking any sharp angles, the large carrying handle offers plenty of space for both hands. Fresh-Water flush port. A water hole is located upstream of the cylinder to confirm that there is water circulation soon after the motor is started. The pilot water hole’s water inspection tube is removable to permit cleaning of the tube and the attachment of an optional connector that allows freshwater flushing of the water jacket.